The radiator in your vehicle is critical to keeping the engine from overheating. Your car’s radiator houses coolant that protects from the damage of hot temperatures. Yet all it takes is the tiniest of leaks to allow that coolant level to drop, leaving you with a quickly overheating engine. When your radiator has sprung a leak, don’t risk finding yourself stranded with an engine that has overheated. Stop in at Auto Parts City to shop for used car and truck radiators at affordable prices. With our help, you can replace that faulty radiator and get back on the road will a functional coolant system. At Auto Parts City, we have a team of used car parts experts who will help you select the right radiator for your vehicle. When shopping for a used radiator, you need to understand that many manufacturers use the same radiators in different vehicles. This means you may be able to find a radiator that fits your vehicle by looking in the engine of a different make or model. Our team knows this, and will help point you towards radiators that will fit your vehicle properly and operate as it should. All of the radiators we offer for sale are tested to ensure they are fully functional. You can be confident when you shop our used radiators that you are purchasing one that will do its job well, keeping your engine cool and your car protected. We stock used radiators that span a wide range of vehicles, not only those currently on the market, but also vintage or collector models. We even have radiators for specialty and work vehicles in addition to passenger vehicles. 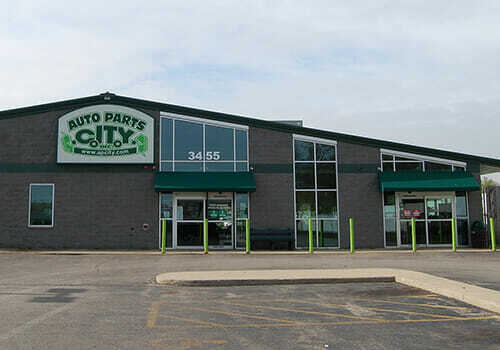 This extensive selection combined with our friendly and knowledgeable staff is one reason why the mechanics in the Chicago area trust Auto Parts City for their used radiator needs. Another reason your neighbors trust Auto Parts City when they need a reliable used radiator is the cleanliness of our facilities. We are a recycling facility, but we are a recycling facility that boasts clean, organized facilities. We carefully recycle everything we can from the vehicles that come to us, including all of the automotive fluids, so you can have confidence that your purchase is helping the local environment, not hurting it. Our dedication to the environment and our clean facilities have earned us the accolade of “Greenest Facility in the Country,” and that is a title we strive to uphold. Used car radiators and used truck radiators are an excellent way to save money on your next car repair. Come over to Auto Parts City to shop our extensive selection of used radiators today, and see what an eco-friendly salvage yard and automotive recycling facility is all about. We look forward to helping you save money on the radiator that will complete your repair project.